There are lots of active sports that people can take part in and one of them is woodsball. The kind of paintball that you use for your gun is something all players should be concerned with so it is best if you do some research first on the best paintballs for woodsball before a purchase. 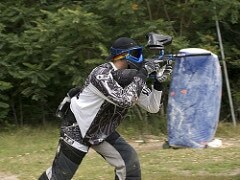 Woodsball is an exciting game and the gear you use for it can have a significant impact on your gameplay. Ammo used for woodsball is composed of an external gelatin-based shell packed with watery paint inside. Great paintball products come with sufficient toughness that it will not break as soon as the player fires the gun but instead, splatter upon contact with the target. In this guide, I am going to show you 4 different products that you might want be interested in. I will discuss which among these products show great promise and help you make informed decisions. 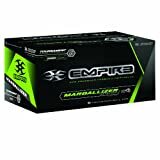 3 What are the Best Paintballs for Woodsball? 6 Who Makes the Best Paintballs for Woodsball? There are lots of brands claiming that they produce the best woodsball paintballs and it can be a bit of pain choosing among the lot. That is why reviews are provided by not only reviewers like me but customers as well. 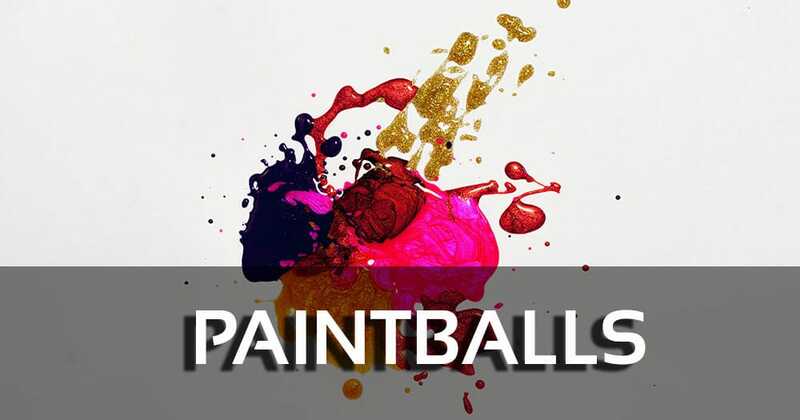 This guide is here to accompany you in the search for the best paintballs for the money. Here are the specifications of the 4 recommended products. As promised, I am now going to provide the unique points that make up each product, and I am going to choose the better item in the bunch. 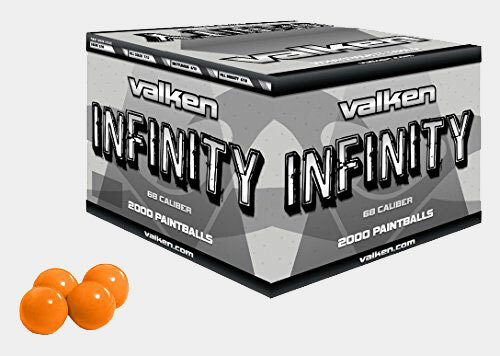 Paintballs from Valken Infinity are composed of an ultra-dense shell. Because of the shell’s build, a lot of players use this for their game. The product comes in a nice range of colors from white to orange. However they do differ in terms of weight depending on the color, with orange being the heaviest. These orange balls fly straight compared to the other hues and it will not get damaged as soon as you break out your gun’s firing mechanism. And as quality paintballs do, will break out once it comes into contact with the target. Another great point of this product is that it is environment-friendly since it is made from 100 percent PEG material and it is not oil-based. Thus all in all, this is a sound product that you might want to check out. The product has a count of 2,000 paintballs, and the price is considered great value. If you play woodsball frequently, investing in this bundle brings lots of bang for your buck. However one drawback of these paintballs is that they can hurt the target a bit, hence this is not something beginners of the sport may consider. Still in terms of quality, this is one product that is worth the money due to its quality and consistent performance. When searching for paintballs, it is crucial that you only acquire quality ones. Price is also a constant concern especially if you want to play woodsball a lot. Hence buying items in bulk can be a good idea if you want to play regular woodsball. 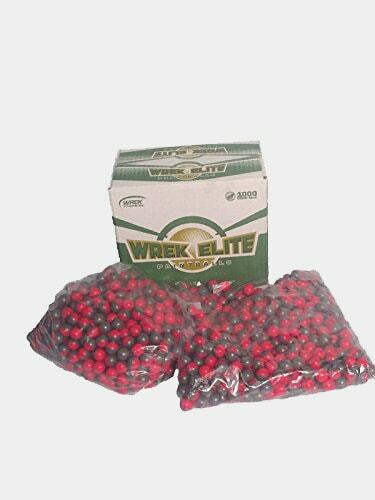 Wrek Elite Premium comes in a bundle of 1000 paintballs which will fit the needs of players who love participating in the sport frequently. 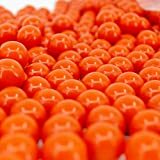 These are quality paintballs that are considered excellent value for a thousand balls per package. The balls are made from topnotch material which helps them retain their form as soon as it is fired out of their places. It comes in a package that includes 2 bags and it does not jam guns. Even those rapid-fire models work well with these paintballs. Another great advantage of this product is that it fits the needs of beginners and even kids. One can use them in 90-degree weather and the ammo will hold up. Some might find the item a bit pricy however for its quality, the product is worth its price. In terms of accuracy, the paintballs did well plus I did not experience any problems with feeding it on my BBs too. If you are concerned about precision and the quality of your ammo, it pays to splurge at times so this product makes the grade in my book. Now if you like paintball and you do some target practice in between, you need a versatile product. In this regard, 3skull’s Paintball Rubber reusable paintball might work for both the sport and target practice. While the product is described/named as a rubber sort of item, it does not have a firm rubber feel in them. You can hit targets with it but it will not hurt them a bunch. I personally think the paintballs have a hollow construction inside so it will impose less impact upon firing, hence less damage on the target. Furthermore, because they are the softer kind, they can cling a bit on the barrel thus leading to a slower FPS. 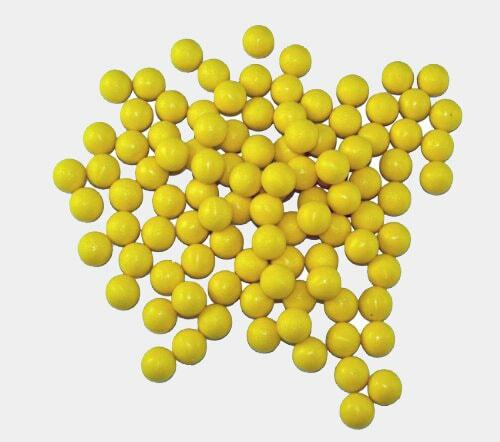 These soft rubber paintballs make for nice target practice ammo because they are non-lethal. If you want to keep vermin away from your home in the most humane manner possible, you can also make use of this product. Another advantage of this product compared to real paintballs is that they are reusable. If the balls get dirty, you can simply wash them with plain water and the dirt will rinse off easily. Thus far this is the only product on this list which has the versatility factor and in this regard, makes it the most unique product on hand. Thick neon paint fill.Colors will be slightly off since this is marballizer paint. One of the concerns that woodsball poses are the ingredients used for the ammo. Sometimes players can’t help but make bad hits so the paintball can hit trees, vegetation or water sources. Players won’t have to worry about this though because a good majority of paintballs are eco-friendly and will not have a drastic impact on the environment. If you want to be sure about what you are getting, then maybe this RPS Empire product might work for you. The product comes with biodegradable, oil-free fill with an eco-friendly formula. This particular formula has been designed to create faster biodegradability so it will not harm the environment. The paintballs were also designed to tolerate elements that can influence its integrity like humidity. Because of this reason, amateurs and professionals alike have embraced the use of this product. Thus far, I have experienced no problems with this item. It did not show any feeding issues, the ammo has a consistent shape and it did well in the precision department. 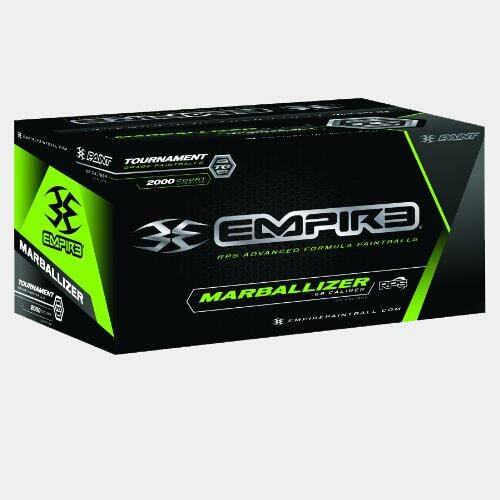 Another advantage of this product apart from its environment-friendly formula is that the balls come in a black and green marbleized color with fills of bright, neon green. The brightness of the fill and the swirls of green on the balls make them a nice ammo for use at night and in settings with low light conditions. What are the Best Paintballs for Woodsball? Paintball is a sport favored by plenty of individuals due to its exciting and tactical nature. Because this is a sport that involved force and quickness, players need to look for high quality paintballs apart from excellent BB guns. The best paintballs for the sport possess crucial factors that we will discuss later on in this article. However tastes and needs do vary so many times it is often up to the user what he or she thinks are the best ammo for the sport. With no further ado, here are some of the things you need to know when searching for a good product. Paintballs in general are composed of a water-based, non-toxic polymer. They are entirely biodegradable as well so it will not pose drastic effects on animals and the environment. However the quality of the paintball can be seen as soon as the player sets off the firing mechanism. If the ammo breaks within the barrel of the BB, possess weak range and precision and has an inconsistent size, then the paintball has poor quality. However if the product does the opposite and is made with a formula that leads to faster biodegradability, then it is a product that is worth shelling out money for. Furthermore, it pays if you actually check out the caliber; the most common caliber is .68 but there are also ones for .40 and .71. The size of the woodsball ammo has to correspond greatly with the barrel bore that you use so it will not slow down your gameplay. As mentioned earlier, there are particular factors you need to remember when searching for a nice paintball product. Firstly, you need to check out its quality. When it comes to quality, this means that the product should have sufficient durability to stay in one piece before it hits the target. The paintball should not break inside the barrel of the gun. Only when the paintball comes into contact with the target that it starts to splatter. Next you have to factor in the product’s price. All of us after all are concerned with the value that prices need to provide so check on the prices on a variety of products before rushing into a purchase. If you want to play the sport regularly, it pays if you buy stuff in bundles. Some of the products mentioned in this article come by the thousands so if you buy in bulk, you can save on money and effort. In terms of color, we all have our preferred colors so purchase the one that fits your personality well. However if you tend to play at night with your buddies or on low lit settings, it would be wise if you spend your buck on paintballs that have a neon color fill since it will create brighter marks on the target. Woodsball buffs know really well that gameplay can be improved on because of the products one uses. So if you play with mediocre ammo, expect to have poor performance instead of one that you can enjoy. If you want to have a fun game, it is important that you are in the know when it comes to your gear. This means you have to assess your capabilities and the gear that you use. No worries though because reviews for such products can be found and they can help you lead to a product that can appropriately accompany the most accurate paintball gun. Who Makes the Best Paintballs for Woodsball? The best paintballs for the sport all possess the factors mentioned previously. Then again, due to our broad, diverse tastes, it is up to the consumer to decide which among the brands step up to the game. I hope this guide and my assessment on the best paintballs for woodsball will prove to be helpful for newbies in the sport and professionals as well. As for my top choice, the Wrek Elite Premium balls met my standards the most. The product comes with 1000 paintballs at a good price, did not break inside the barrel and made for good accuracy too. It has the factors I want in a quality product.